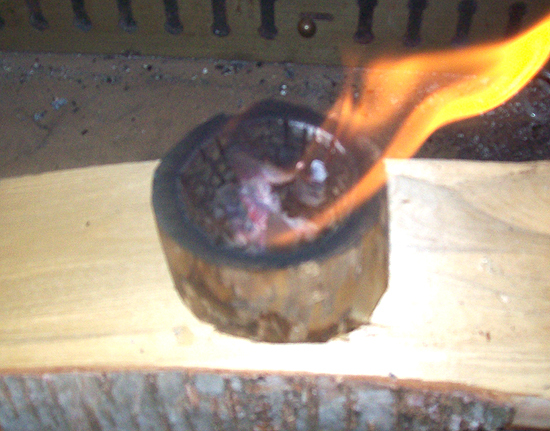 Recycled part of the stump of Christmas Tree...burned it hollow for the frame. Used deer rawhide from tanning last Summer for drum-head and lashing. Dogwood handle a-fixed with pine pitch, as well as dogwood beaters tethered with buckskin, and buckskin handle wrap. 1). 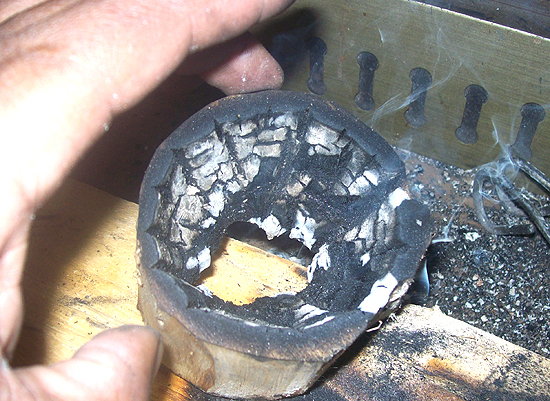 Start with coals or embers from a fire. 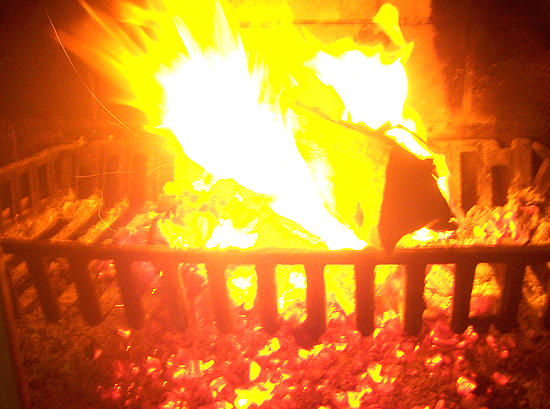 Here I have a good fire going in the fireplace. I DO NOT RECOMMEND DOING THIS PROJECT INDOORS!! 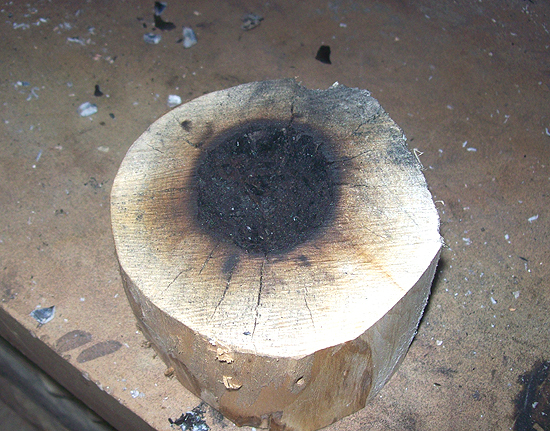 Be very careful not to burn yourself! 3). Blowing may cause your coal to flare up. BE CAREFUL! If this happens allow the flames to die down before blowing on the coal again. 5). 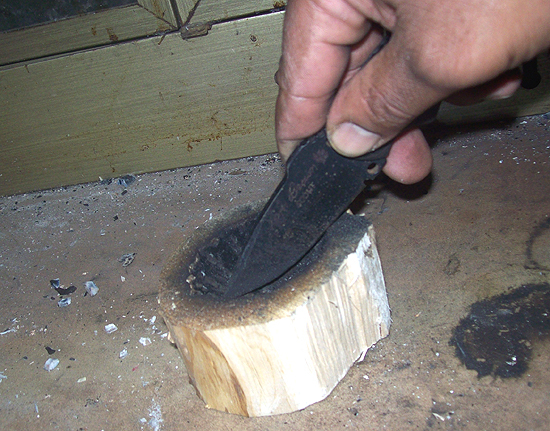 By scraping away the loose char you will start to create a pit in your wood stock. Repeat the process from step 2. As you add coal(s), blow/burn, and scrape your pit will become bigger and deeper. Remember to use your straw to control the rate and size of the burn. 6). Here I have gotten pretty deep and wide with the burn. You can see a flare-up in this pic. 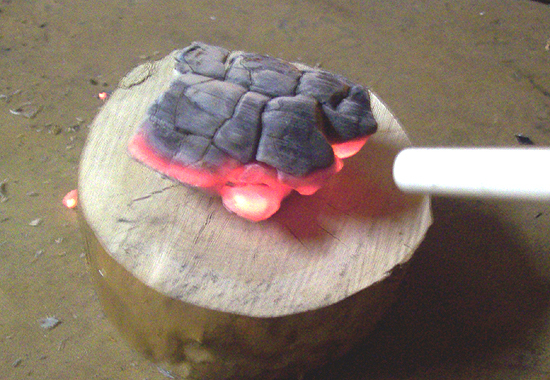 Sometimes you can just blow on the char to control the burn without adding any additional coals. 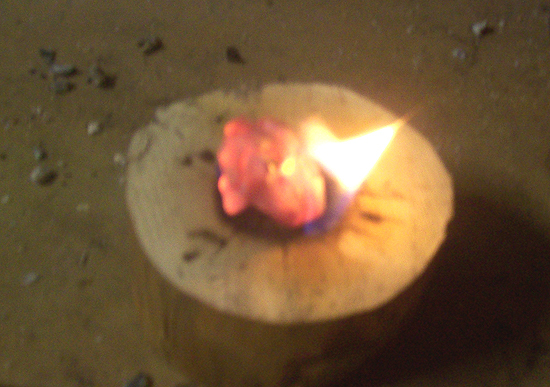 Note how the wood stock is placed on a block of wood to proctect the fireplace surface. 7). Here, I have pretty much burned all the way through. I would now use my knife and start to scrape away and shape the interior of my drum-body. I may even try and burn from the other end to create uniformity of the interior. 8). 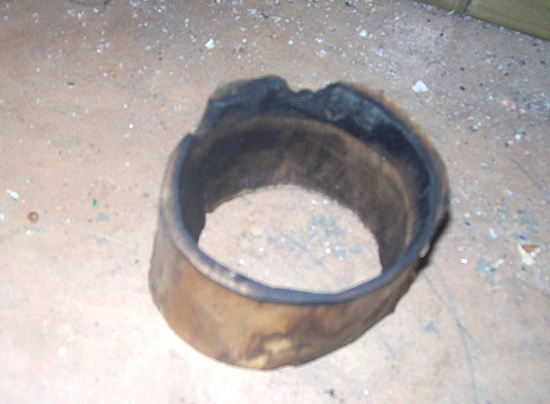 This is the finished wood stock hollowed out in to the start of the drum-body. I have scraped and sanded the interior to try and get as uniform of thickness all the way around as possible.